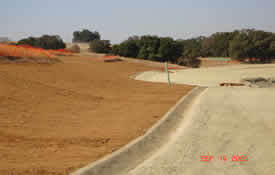 Twelve Bridges, Village 9, owned by Placer Holding, Inc. infrastructure was constructed the winter of 2006 in the rolling hills of Lincoln, CA. 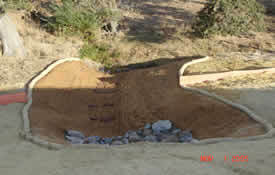 The soils are very fine and tricky when constructing during wet season. 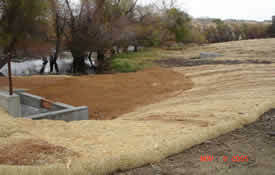 The Storm Water Pollution Prevention Plan was prepared by Beth Smiley, CPESC, CPSWQ of Thunder Mountain Enterprises, Inc. 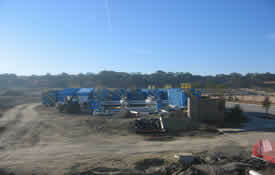 The soils, hydrology, including 100 acres shed-on to the site, construction timeline and adjacent creek as receiving waters were significant considerations in the design. 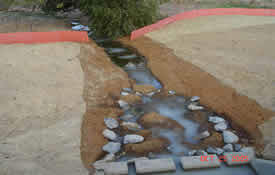 Advanced Treatment of Storm Water was considered highly likely early on due to the fine clayey soils, three outfalls directly into the creek and a construction timeline that would certainly get into wet season grading and underground utilities. 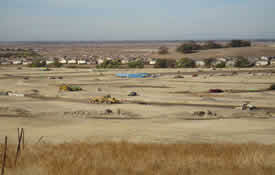 The 133 acre site had multiple other challenges. Experienced Construction Management of Rob Parish from Parish and Associates in this region emphasized proactive Storm Water Pollution Prevention Plan preparation. 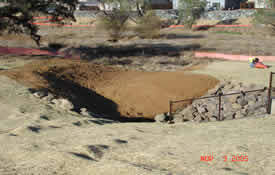 Among the many challenges were multiple outfalls into the creek that were designed to be vegetated instead or hard armor with the influence of Thunder Mountain. There were massive cuts and fills and many terraced lots. 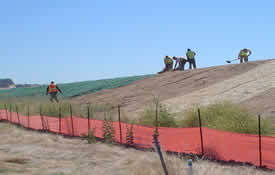 The slopes of the lots were seeded and blanketed due to the sensative nature of the soils. 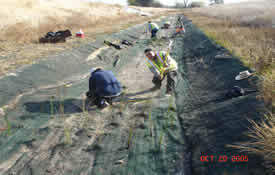 There is an open space to the east with many slopes that were also seeded and blanketed and silt fenced for protection until vegetative establishment. 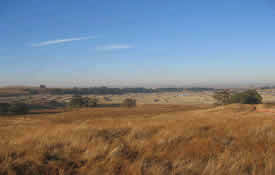 The mild early winter allowed half of the site to pave prior to significant rainfall. 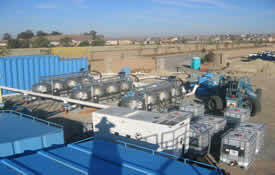 So, the Advanced Treatment System could be downsized to treat less storm water discharge. 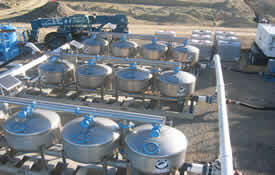 However, the inability to dig a basin required multiple tanks to capture the rain event, be treated in secondary tanks, run through sand filtration before being discharged at below 10 NTU. 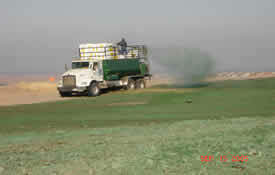 The site treated millions of gallons.